frankly my dear...: A cake party?! Oh my goodness, is this not heaven? 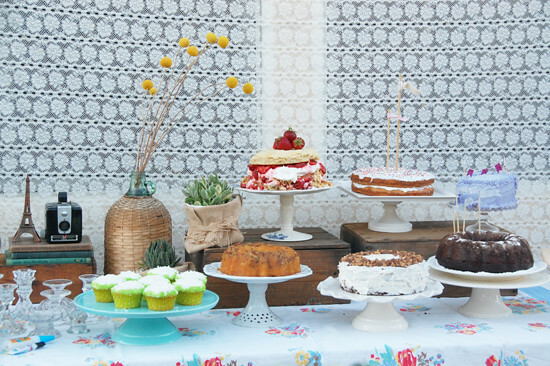 I saw this fab cake party over at Cakies blog & thought it was an awesome idea - invite some lovely friends over for a cake party, each guest brings a yummy cake on a pretty cake stand. I so have to do this. Nothing like a pretty pig-out session. Go check out Ruby's blog for more photos & details of the party (unfortunately she forgot to invite me....hehe). p.s.......see those round yellow flower thingys in the bottle on the left - anyone know what they are? i have been seeing them over at pinterest & am wondering if they're available in australia. i want some! If I lived closer I would come if you did this. One reason I enjoy midweek tennis is because we get to have a light lunch where we sample all the homebaked goodies. I love baking new things when it's my turn. oooo i love this! i love cakies and i love cake. :) those lovely little gems are billy buttons and they're available in aus! my best friend is a florist and she uses them alllll the time. love! Thanks so much Kit & Nancy, i have been wanting to know what those billy buttons are for a while now!